Ask any corporate video company, the delicate art of the talking head is actually one of the most skillful types of video production, although it is really considered to be bread and butter in the video production industry. As with everything which seems simple, if it’s not done really well – it can look really bad. Here we will share a decade’s worth of experience of the noble art of producing a great interview for a talking head corporate video. If you happen to be a marketing or communications person working for an organisation, you have the luxury of choosing who to include in your opus. Environment is of course critical in the production process for a number of reasons. If you are shooting at the company HQ, it is vitally important to find talking head locations which work both visually and audibly. Crews normally come with a lot of kit and can be disruptive, especially if there are a lot of lights involved with cables flowing everywhere to trip over. Visually – when a comms or marketing dept are briefed by video production companies, it’s common for them to find a quiet office where the project can go ahead without much distruption. Small offices are never great however, because the visual behind the interview subject can look really uninspiring and dull. What is much better is to shoot with as much natural light and depth of field behind the subject as possible. This runs head long into the issue of sound. Capturing good sound is even more important that capturing great visuals because people are used to the occasion shake of the camera or lose of focus – but if the sound is bad – that reflects badly on the video production company and the product. It’s a paradox to get right! You’re role as a talking head video interviewer is totally fundamental to the finished project. 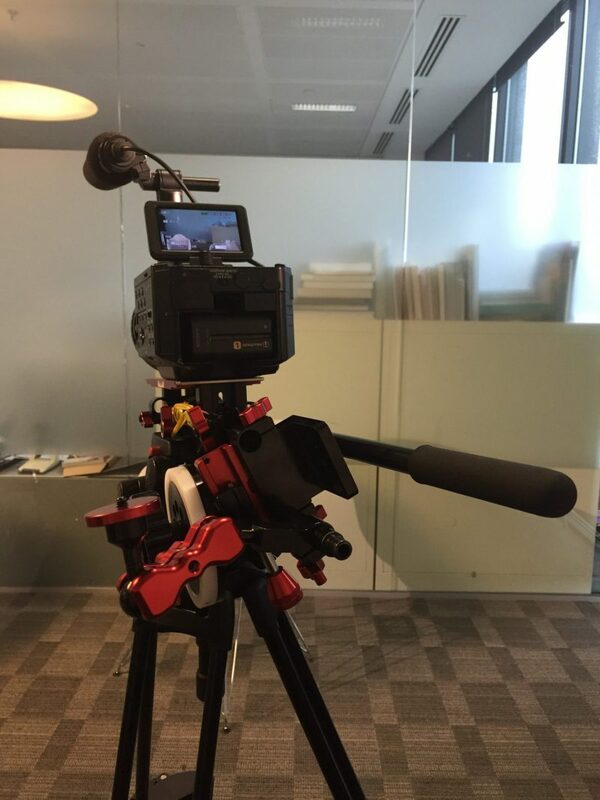 It would look very silly if you went to shoot a corporate video production without the proper preparation. So the subject has sat down and is miked up. It’s critically important to keep the subject relaxed and engaged. It’s normal practice to run though the questions as a rehearsal before. It’s also fun to throw in a couple of questions not related to the project to loosen them up and build rapport. Many people when under the dado lights can feel the need to blather on when asked a question. It’s really important to wrangle this impulse and get nice, concise “soundbitey” answers – your editor will appreciate it! Equally as important is to make sure that the subject isn’t obviously reciting a script, this can make them look dead eyed as they try to remember the next sentence. Remember that it’s meant to be a conversation. People frequently go a turgid shade of green when they are stuck in front of a video camera. It is really important to put people at ease. It is interesting to see interviewees reading your face as they wait for questions to be asked. It’s really important to keep the mood lighthearted and relaxed – you can often see people’s face tense up if you forget to smile as you’re sitting in the interviewers chair. One of the bug bears when we send off new crews in some far flung corner of the world is the issue of just parroting out the questions. The client and interviewee are worth a bit more than that. The whole point of the interview is produce natural sounding answers which can be cut together to create an engaging narrative. If the interviewer is just reading the question with no real understanding of the subject or what the question means to the client or the interviewee, you look rather silly. It’s so much better to come prepared and lead into the question conversationally. Perhaps riff back and forth with the subject leading into the question – asking in an interesting way which could emote a most interesting answer. Occasionally you are confronted with a subject who has never been in front of camera before and who’s every pore would rather be anywhere else. You can see the fear in their eyes, their body language and the simple face they’ll probably make it abundantly clear they don’t want to be there.! it’s important in these cases to spend much more time making the subject relaxed with you as interviewer and your whole crew. Talk about pretty much anything else to build rapport and lead gently into the interview questions without hurrying anything. We’ve found with really scared people it’s best to be having a nice conversation about the weather, then slipping in the interview question very subtly. If they answer it naturally and well – great – if not – you lead them back to the familiar territory of the weather (or whatever) and have another go.